Very few places in the world resonates a charm as charismatic, as authentic,as bohemian and as unique as Prague. Deeply rooted in its history, the city is strewn with colourful baroque buildings, prominent Gothic churches and other such relics. A part of city’s unique culture is the art of brewing world-class beers and winemaking. Perfectly suited for a reposeful, rejuvenating and a relaxing holiday in every season, spring adds a special beat to Prague. Lined with multiple festivals for food, beer, rum, wine and music there is no place like Prague in May. Why is Prague in May a must-visit? The Praha Spring - Often referred as Praha by the locals, Prague bursts with white, purple, pink and yellow blooms during May. While the flowers perfectly compliment the city, the pleasantly warm weather chaperones the visitors as well as locals for a great time. Less crowded - Prague in May is like that small window of calm before the flocks of summer tourists starts arriving. You will be able to explore and enjoy the city without the crowds, while availing great deals on accomodation and travel. 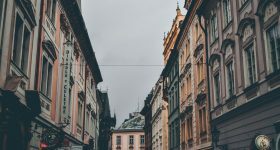 Festivals - The calendars for May in Prague are chalked up to festivals, whether you are looking forward for a gastronomic experience or to sample some vintage wines or some frothy beers, you will get what you want and more. Intertwined with great music ranging from jazz to contemporary, each of these festivals summons the locals and enthusiasts from all around the world. Prague in May experiences a beautiful warm weather with temperatures ranging between 15-25°C during the day. However, three days in the middle of the May are referred as the "frozen Saints" days, when the temperature drops near freezing in the morning. So, its safe to say that during May, Prague could turn from chilly to sunny to warm to rainy. One of the most important monument in the Czech Republic, the Prague Castle is the largest castle in the world. Spread across 7 hectares, the castle has 3 courtyards and some stunning historic buildings. The pleasant weather of May, allows you to explore the castle ground with much comfort . One of Prague’s original city gates, the Powder Tower is a marvelous example of the Late Gothic architecture. Still part of the royal route, the gate is a vision to look at. During the 17th century, the powder tower was used as a gunpower store, earning its peculiar name. Situated within the Prague Castle complex, the Renaissance and Baroque inspired architecture of the cathedral is breathtakingly beautiful. Being the sight for coronations of Czech kings and queens and the burial grounds for many notable personalities, the St. Vitus Cathedral carries a lot of historical, religious and cultural significance. Though known for its Baroque, Gothic and Art Nouveau buildings, Prague also proudly boasts an exemplary example of modern architecture - the Dancing House. The uniquely fluid architecture design of the building resembles a pair of dancers. One can only imagine how that May’s soft light would enhance the glassy exterior, or they could just visit in May. Whether you are a theatre enthusiasts or not, the National Theatre in Prague is a visual treat. Form the awe-inspiring exterior to the luxurious embellished interior, everything is just ornately beautiful. Furthermore you can choose between a drama, opera or a ballet performances or see all three of them. Believe it or not, the 600 year old clock still works and displays the time, date, astronomical cycles and Christian holidays. To the delight of its spectators the clock rings its signature bell every hour as the 12 apostles peaks out from its windows. Make sure to time your visit accordingly. Sail across the lifeline of the Czech Republic and experience Prague’s historical landmarks from a new perspective. 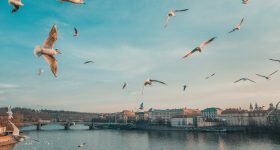 With the May sun perfectly backlighting them and the spring air working its magic a Vltava River Cruise will present you a engrossing, rejuvenating and enriching experience, that you can’t afford to miss. 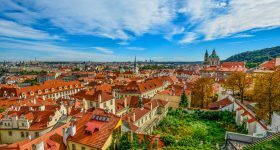 Stamped with their own brand of oId word charm, visiting Prague’s most popular neighborhoods is a trip that you must take. Take advantage of the moderate May weather and for a walking tour, that will allow you to closely explore the magnificent history of these places along with a professional guide. The love affair between Prague and beer goes back to 993 AD, it will not be easy to explore this connection by yourself. Let a local expert help you explore some of the most celebrated beers of the Czech Republic and the most iconic bars and pubs of the capital. 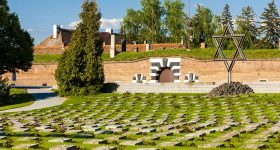 The Terezin Concentration Camp has borne witness to some of the most cruel, inhuman and repulsive acts. Over 150,000 jews including 15,000 children were imprisoned and tortured here by the Nazi guards. A tour of this terrifying concentration camp will arouse equal parts pity and equal parts anger . Prague isn’t one of the most romantic place in the country for nothing. Following the Karel Hynek Macha epic poem ‘May’, lovers follow some traditions. Such as sharing a kiss in front of the poet’s statue at Petrin hill, or sharing a kiss under a cherry blossom or any blooming tree. This year mark the 74th anniversary of Liberation Day in Prague and the Czech Republic. Indeed a very notable event, expect various events being organised all over the city. Since it’s a public holiday, major shops and business are either closed or open for limited time. Celebrating its sixth edition, the Rumfest privy the visitors to a wide variety of rum that they can taste and subsequently purchase at special festival prizes. Along with Latin American Music, delicacies of Caribbean cuisine and special rum cocktails, the event will also host training sessions and workshops for true rum enthusiasts. The Degustational Festival of Rosé wines and Claret hosts over 25 wineries from Moravia and Bohemia. Don’t just sample the wine, have a gala; there’s plenty of food including grilled fish, seafood, foié de grass, baguettes, cheeses and prosciuttos and there’s plenty of live jazz and swing music. The Open House is the world's largest architectural event which takes place every year in over 42 cities. The 2019 Prague edition invites enthusiasts to visit 40 buildings, that will be otherwise inaccessible. These spaces range from headquarters of companies to rooftops of office buildings to secret dining salons at a railway station. The biggest wine festival of Prague beckons lovers of wine to sample over 400 wines from 70 different winemakers hailing from Central Europe. The participant winemakers are devoted toward the craft and do not use chemical or additional flavors. A must attend event if you want to taste and collect some vintages. As the name suggests, this event bring Asia into Prague, well atleast spiritually and gastronomically. An extremely popular street food festival in Prague, it relishes authentic cuisine from China, India, Vietnam, Malaysia, Korea, Thailand, Japan, Indonesia, Sri Lanka and Philippines. Skilled performers from mentioned Asia countries perform depicting the culture of their respective country. A day to celebrate the enthusiasm, hard-work and achievements of workers. While many shops, business and even some major attractions, remains closed or open for limited time, the city buzzes with much excitement. Some part of the excitement could also be attributed to the Love day celebrations happening across the city. Over the month of May, the temperature steadily observes a rise, the 16°C high during daytime goes up to 20°C by the end of the month. Expect plenty of sunshine with the hours of daylight also steadily increasing. Around 69mm of rain is received between 17 days throughout the month. 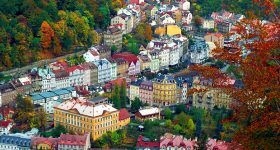 Prague offers multitude of accommodation options ranging from hotels to youth hostels, from apartment to campsites. With plenty of options available, you can choose the best suitable place depending upon your itinerary and travel budget. As mentioned above Prague is mostly warm during May, but cold winds and rains are known to be part of the season as well. The trick to dressing for Prague in May is layering, pack clothes that can be layered up and layered down as per the temperature outside. The packing list includes: Rain jacket, umbrella, scarf/hat, sunscreen, Sunglasses, lightweight jacket jeans, cotton shirts/blouses, shorts, cotton pants and most importantly comfortable shoes for your long walks. Entrust your travels in and around Prague on the city’s public transport system that is easy, reliable, and very affordable. The capital city of Czech Republic has one of the best public transportation systems in Europe with a well connected network of metro, trams and busses. The speedy metro takes will take you closer to your destination, catch a bus or tram for the remaining distance or just walk. The integrated ticket system in Prague allows you to travel across the city on one ticket. Depending upon your itinerary, you could opt for a tourist transport pass or the Prague City Card. Festival etiquette - Prague in May observes many Music, food and drinking festivals. While the bottom line for such events is fun, it is important to note that your fun shouldn’t create troubles for others. The festival authorities are very strict about maintaining the decorum of their event. Beware of Pickpockets - Wherever there’s crowd scammers/pickpockets becomes quite active, especially at festivals. Mind your personal belongings at crowded places. Also, prefer buying event tickets online from a reputable source or at the event counters itself to avoid getting scammed by a middle man. Take walking tours - The best part of visiting the city in May is the weather, you can comfortably take long walks around the city. The best way to do so, is to join a walking tour of your choice and have a professional guide take you through the hidden gems of the city. Additionally, guides can often refer you great tips and tricks to enjoy the city better. Taste the Brew - Even if you are not much of a beer drinker, when in Prague surely taste their brews. With multiple festivals organised around the town during May, finding a good brew or two is not that big a task. Moreover, whether at bars or festivals, you get to eat great food and meet new people, locals and tourists alike. Meal with a view - As Prague steps into May, the restaurant owners start opening their outdoor and rooftop seatings again. With amazing view everywhere you look, make sure to enjoy a meal or two at such quaint places. Street Food - Czech cuisine is quite unique, especially the street food. Taking advantage of the weather and the upcoming tourist season, street vendors are commonly spotted across Prague during May. Make sure you try some of Prague’s most famous street food and don’t forget to thank us in the comment section below for the suggestion. Ready to Visit Prague in May? Here are some detailed blogs that will help you plan your Prague vacation better.